From April 1, 2013 through June 30, 2013, Peyton Manning's No. 18 Denver Broncos jersey was the fifth-most purchased jersey in the NFL, per CNBC.com. 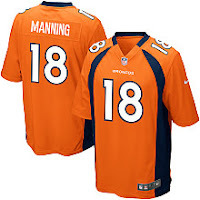 Manning led jersey sales for most of last summer and the 2012 regular season, but now trails San Francisco's Colin Kaepernick, Seattle's Russell Wilson, Washington's Robert Griffin III and Minnesota's Adrian Peterson in the rankings. After training camp sales and pre-season hype, Manning will likely climb the rankings again, perhaps getting back into the top three during the regular season. Be advised, however, that NIKE appears to be preparing to tweak Denver's uniform. Once Denver's potential collar change becomes official (assuming the changes will happen), Manning's new and improved jersey will become an even hotter buy, which will undoubtedly boost his ranking.